My fascination with the Batmobile began when I was about 5 years old. 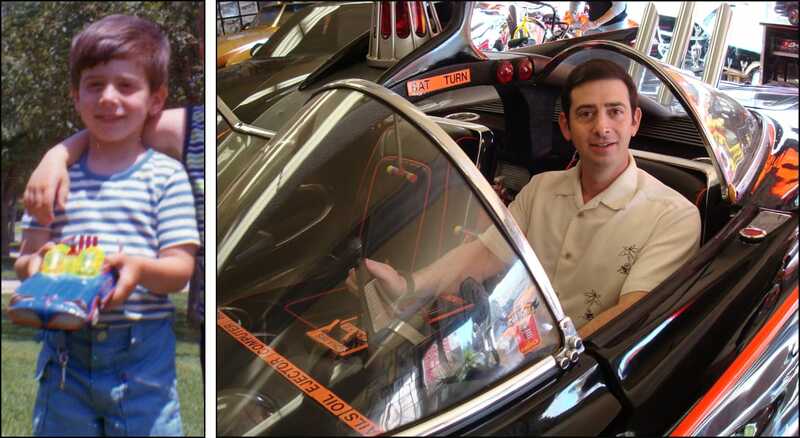 The photo on the left is with my favorite toy — a tin battery-operated Batmobile. I remember playing with it all the time until it stopped working one day. Thanks to my grandfather, the motor was fixed, but unfortunately the prognosis for Robin’s caved in head was grave. Fast forward 20+ years… My tin toy was LONG gone, but nostalgic for the past, I set out on a search for a big piece of my childhood. I scoured antique and collector shows and after quite a few years, finally found one (this was pre-eBay). It set me back about $250, but I was happy to pay the price. Little did I know this quest would eventually lead to my adventures in meeting the creator of this icon, George Barris, and the consuming hobby this website has become. Since creating the site in 1999, I have had over 10,000,000 visitors & the site has been featured in The New York Times, The Sacramento Bee, Motor Trend, Motor Trend Classic, Car Craft, Car & Driver, RC Driver, Car Collector, RIDES magazine & many other publications. 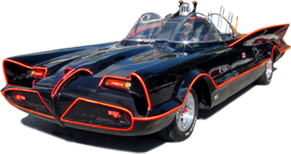 I have also been used as a reference source for the #1 and replica Batmobiles and I worked with Barris Kustom Industries, Mattel (Hot Wheels), Polar Lights models, The Discovery Channel and on the 1966 Batman Movie Blu-ray. In 2013, I attended the auction of the #1 Batmobile and had the honor of being on stage when it sold for $4.2 million. And in 2016 & 2017, I assisted the new owner of the #1 Batmobile in its restoration. This site is dedicated to George Barris and all the craftsmen that customized & worked on the Batmobile.